If you have a lot of student debt, then I'm sure you've considered consolidation. Whether it's the right move for you or not depends on your situation. I'm here to provide info as to why it might be a great idea, and also provide the best consolidation of student loan information that I've found. Long story short, it might be wise to consolidate your student loans now if you’ve been considering it. Currently, we are looking at an economy that is getting harder and harder to predict. And a consolidation of student loans will be beneficial if you use a fixed interest rate, get rid of your cosigner, and start paying down your debt right away. While many have described the country’s student loan status as a bubble, I wouldn’t want to be left holding the hot potato if rates begin to increase. Optimize your terms of debt and start living your life without that monkey on your back! Many personal finance gurus preach to automate and streamline your finances. It’s true that the best way to do anything is to create a system. 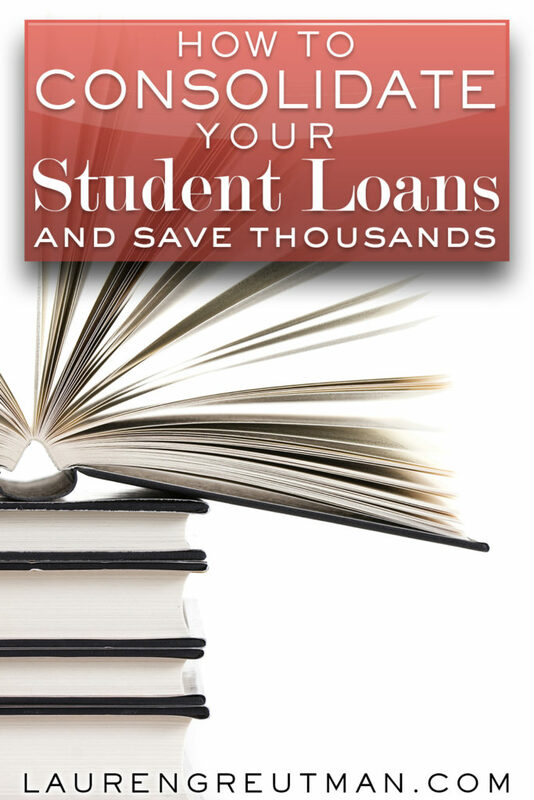 Organizing your student loans can be your first step. Instead of having to pay 3 different balances with different rates and repayment schedules, debt consolidation can make this process a bit simpler. It’s less overwhelming to tackle one problem with all the resources you have available. As humans, we are motivated by visual progress. Seeing that one balance keep going down may be just the incentive you need. Getting rid of your cosigner can also get rid of your headaches. Though most 18-year-olds aren’t thinking about this aspect of things when they are signing their loan papers, it can be stressful for the cosigner. Consolidation may be an opportunity to let mom or dad off the hook for getting you through college. Also, loans in default can be rehabilitated quicker through consolidation. This is a huge plus, as no one wants to experience wage garnishment. Don’t procrastinate the process! Beware of the lifetime cost of your new loan. Many times, lower payments turn into longer plans. Yes, you may have lowered your interest rates and monthly payment but your 10-year loan is now 15 or 30 years. Once all the math is said and done, you will pay a higher cost. Though it may be right for your personal situation, it’s just something to think about. This is a decision that can be better evaluated if you know how to budget. As anyone in the finance game will tell you, knowing your numbers is a must. Use your situation as motivation to get financially literate. Another obstacle to be mindful of is loan consolidation scams. Be suspicious of offers that dramatically lower your rate, use your common sense to gauge the reasonableness of the numbers. You should know that consolidation rates are derived through a method of weighting the average of your current interest rates, therefore a dramatic reduction is unrealistic in most cases. As in everything you do, make sure you know your numbers. That will be your best defense versus the sharks who want a hand in your pocket. If you haven’t run into them yet, you will! Sites like Credible.com can be a good start to get this process moving. Fill in some details about your loans and they will help you explore your available options in one streamlined process. Credible provides simplicity to a process that most avoid at all costs. All you have to do is fill out a brief form and all permission for a “soft” credit inquiry. Don’t worry, this won’t impact your credit score. The best part is that their service is completely FREE. Credible eligibility requirements (per their website) – You must be a US Citizen or permanent resident, aged 18 or over, with more than $5,000 of student loan debt. At this time, borrowers currently enrolled in a degree or other educational program are not eligible to use their service. No matter what resource you use, do your due diligence. Before contacting anyone, read every article and pick up a few books. You may even want to consider a financial coach. Make sure you are qualifying the information you are taking in, just googling a term may pick up something written in 1997. While you can take some of that advice with a grain of salt, things have changed a bit. It will help you fend off those lenders who may try and take advantage. Some are feeling so underwater that they are hoping for help or maybe even a government bailout. This is no mindset of success. Take control of your situation. When in dark times, I like to think of my life as a story. What a story it would be to overcome your problem, in this case, it’s your debt! As Gandhi said, be the change you wish to see! Eric Estevez is a personal finance writer, coach, and speaker at jiu-jitsu finance. Using his background as a tax professional, Eric uses the art of jiu-jitsu as a concept for mastering your financial goals, and achieving financial independence.